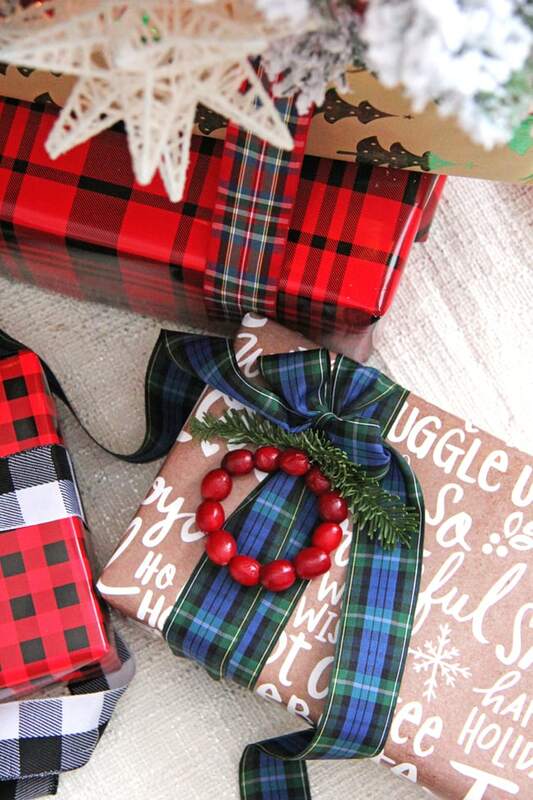 Simple & festive gift wrapping ideas using plaids and natural elements! Perfect for Christmas. Welcome my friends! 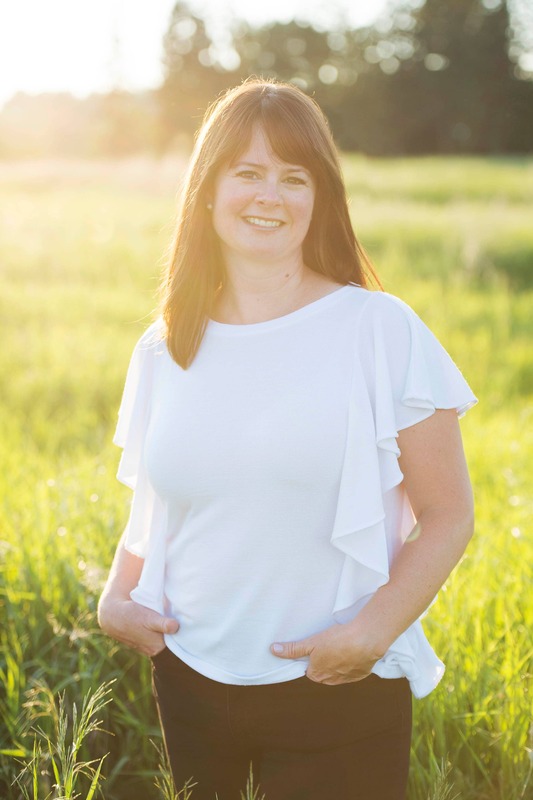 I’m so happy you are here today because there is a TONNE of inspiration for your holiday gift wrapping. 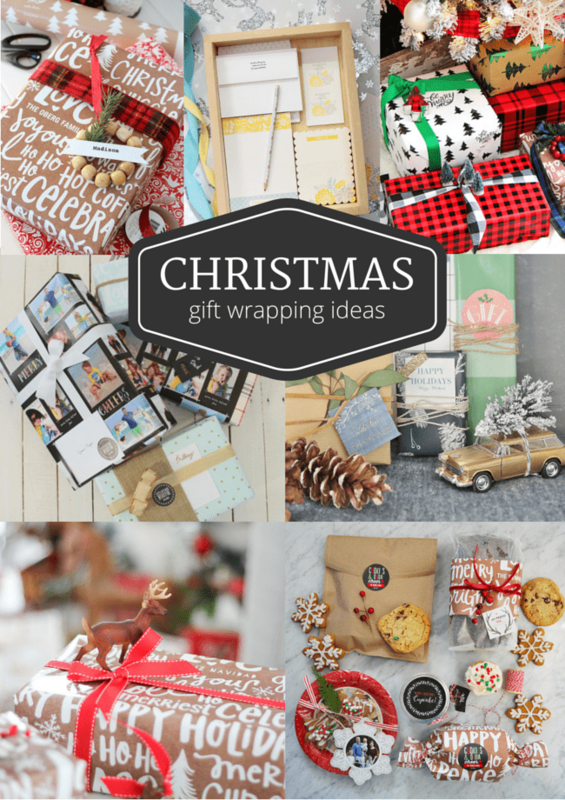 I’ve teamed up with a group of very talented bloggers who are sharing some tips and ideas for wrapping. 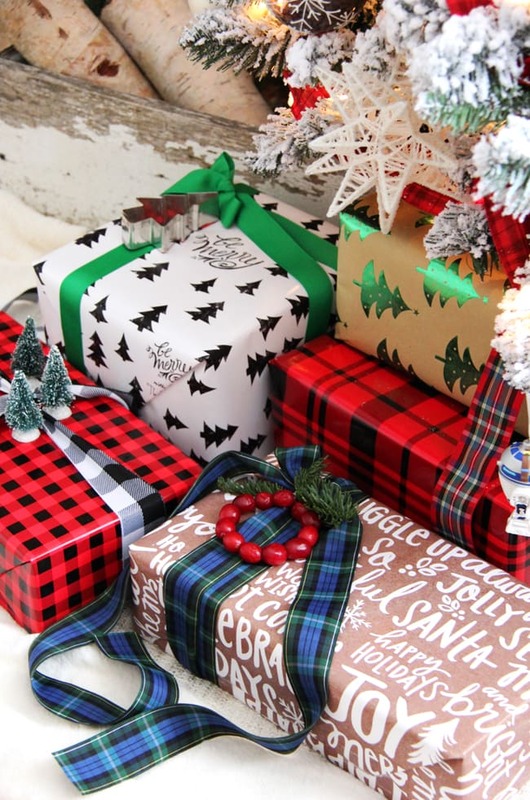 My biggest inspiration for my Christmas decor and wrapping this year though is plaid. I love plaid…I *may* have bought all the members of my family plaid shirts for the holidays…when we’re wearing them we kind of look like a group of lumberjacks, but I secretly love that. Shhhhh, that’s the Canadian in me. I wanted to mix up patterns and textures in my wrapping, but at the same time have them all match in a weird mismatched kind of way. But I think it works. Plaid on plaid, kraft paper, white & black paper, more plaid and some homemade gift attachments. LOVE. Oooh, I spy R2D2 in here. Somehow I missed that when I was taking my pictures, but it gave me a good laugh! I have a house of boys waiting not so patiently for the new movie to come out! Anyway, I had some fun putting all of these gifts together…I enjoyed playing with patterns and textures. 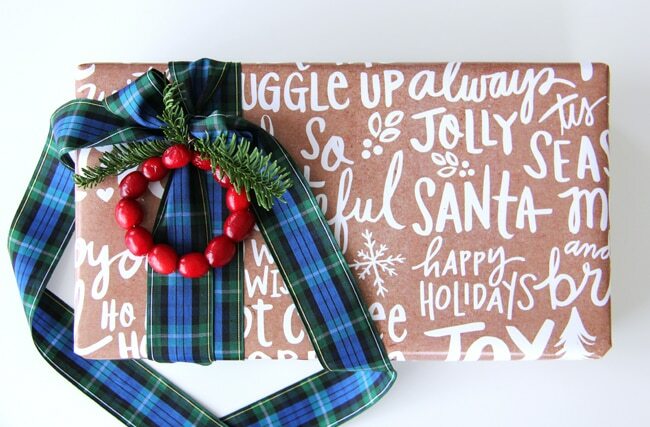 This first gift is wrapped with a kraft paper like wrapping that I ordered from TinyPrints! 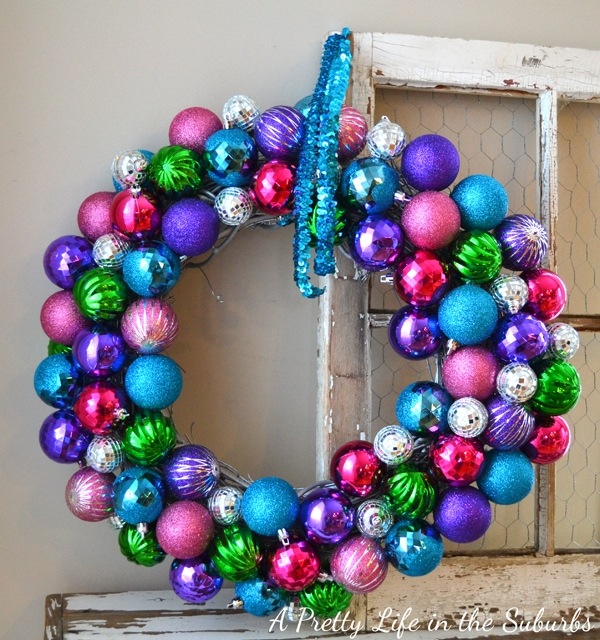 It looks so nice with the blue & green plaid ribbon, and cranberry wreath ornament. These cranberry wreaths are very easy to make, and they finish off the gift wrapping so nicely. All you have to to to make these cranberry wreaths, is string fresh cranberries onto some wire and bend the wire into a circle shape, then glue on a couple sprigs of evergreen tree. Done. Pretty and festive! I also really like black and white for the holidays, which I know isn’t classically Christmas, but these colours are so easy to make festive by adding in splashes of colour. For this gift I also used wrap from TinyPrints, and I bought some emerald green ribbon to tie around it which pairs so beautifully with the black and white paper. To add a little more colour I made the cookie cutter ornament to hang from the ribbon. I just glued some plaid wrapping paper to the back of the cookie cutter and trimmed the edges. Not only does it look festive, but your gift recipient also receives an ornament for their tree! On a side note, my puppy loved this ornament so much she tore it off the present 5 minutes after I got all of my pictures, and proceeded to eat the paper. Puppies are good times. Anyhoooo, have I mentioned how much I love plaid? This gift wrapping is my favourite. F.A.V.O.U.R.I.T.E. I absolutely adore this red and black check pattern. Finished off with some white and black check ribbon and a few bottle brush trees, this gift wrap is adorable. These trees. I love them so. 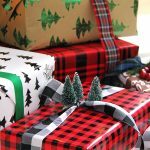 Now that I’m done giving you a tour under our tree, it’s time for even more gift wrapping ideas! Make sure to head on over to these creative and talented bloggers sites and show them some love! Traditional & Festive Gift Wrapping Ideas by me! Thank you so much for being here today! I hope you left feeling inspired to get wrapping! 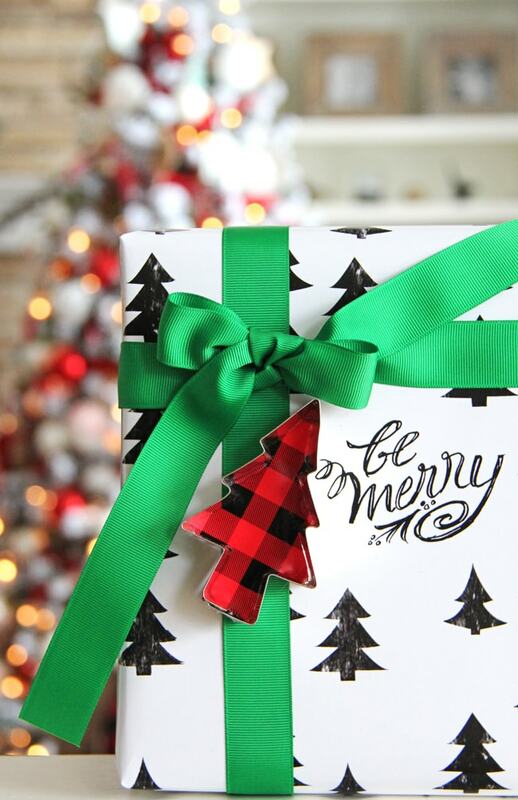 Thank you to TinyPrints for all of the gorgeous holiday gift wrap! 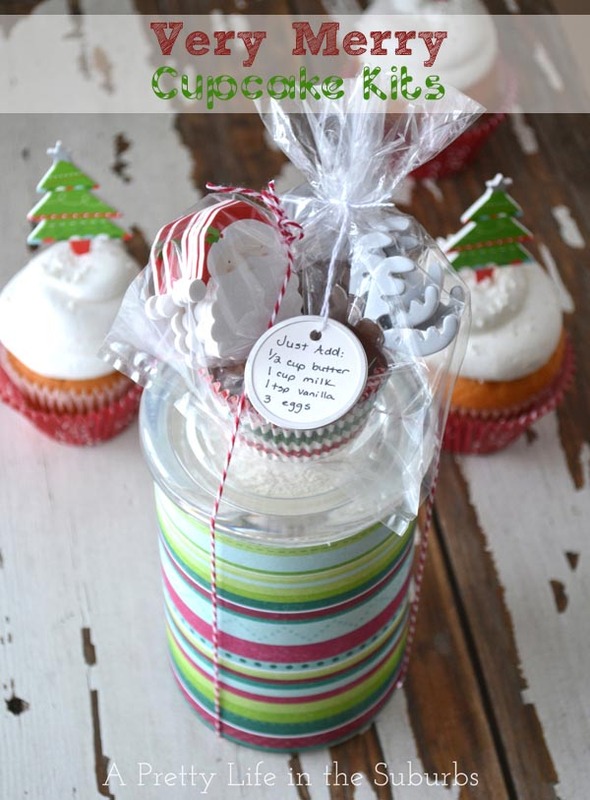 Holiday Gift Ideas: Very Merry Cupcake Gifts! LOVE LOVE LOVE all the plaid! 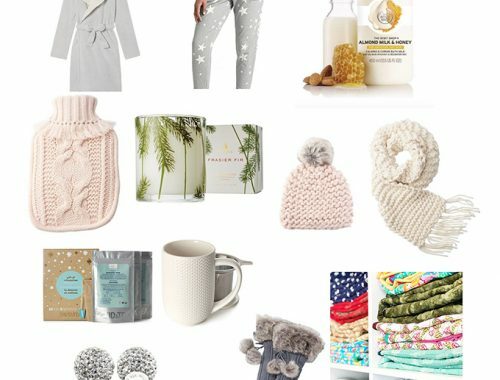 Your gifts look perfect and that cranberry idea is genius! I can’t wait to see that whole flocked tree, looks dreamy! Thank you Virginia! And I can’t wait to share my tree too! Oh my goodness, so pretty and festive Jo-Anna! 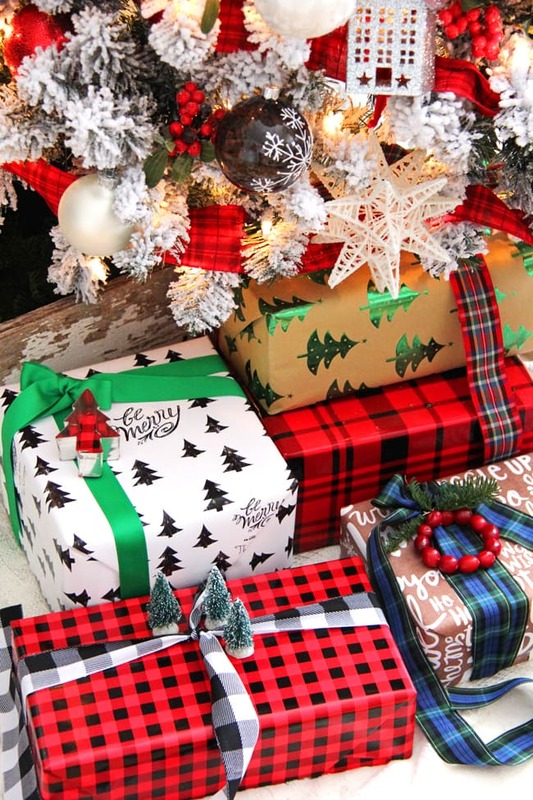 I just want to dive under that gorgeous flocked tree and start ripping into those gifts- they look so enticing! Are any for me? WOW! Great stuff on there. I LOVE the personalized gift wrap! SO neat! The whole collection looks great, Jo-Anna. 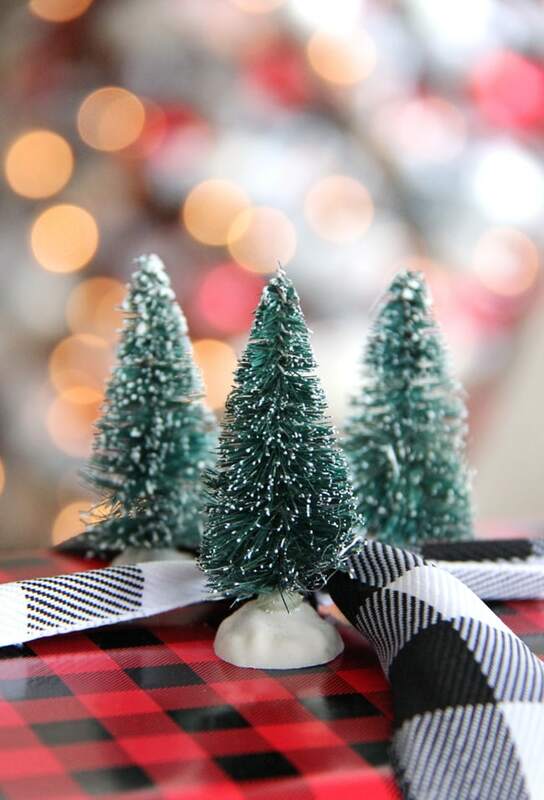 Love those preppy plaids and personalized details like those little adorable trees! Thank you Shauna! I’m loving plaid so much this season! My daughter is expecting a little girl in March the ABSOLUTELY IN LOVE: TEA ROSEFOIL STAMPED GIRL BIRTH ANNOUNCEMENT would be perfect! So hard to pick just one thing. I really like the Easel art. That would be a great way to display some family pictures! 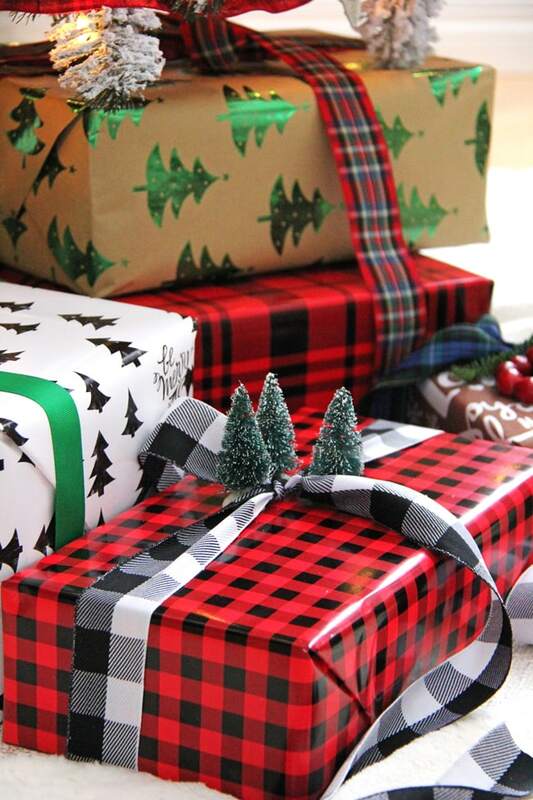 Great wrapping ideas! 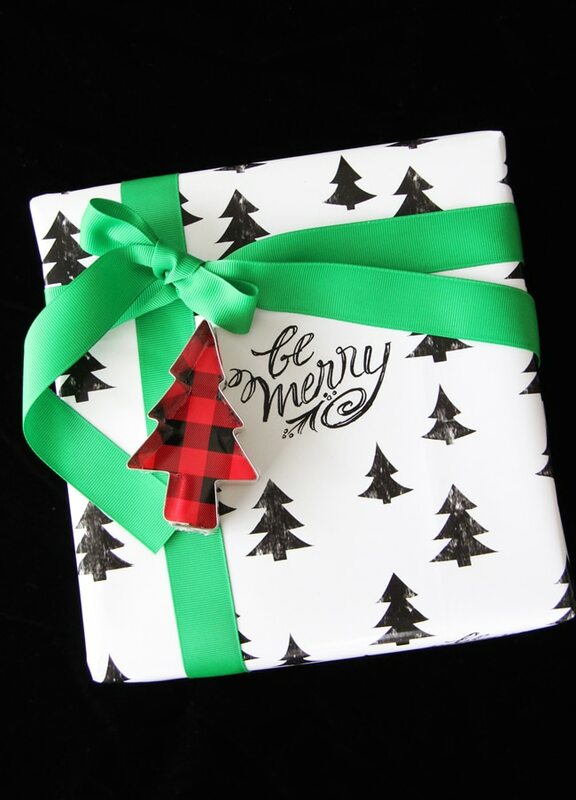 I love the wrapping paper from TinyPrints, especially the Merry Woodland themed wrap. GORGEOUS! 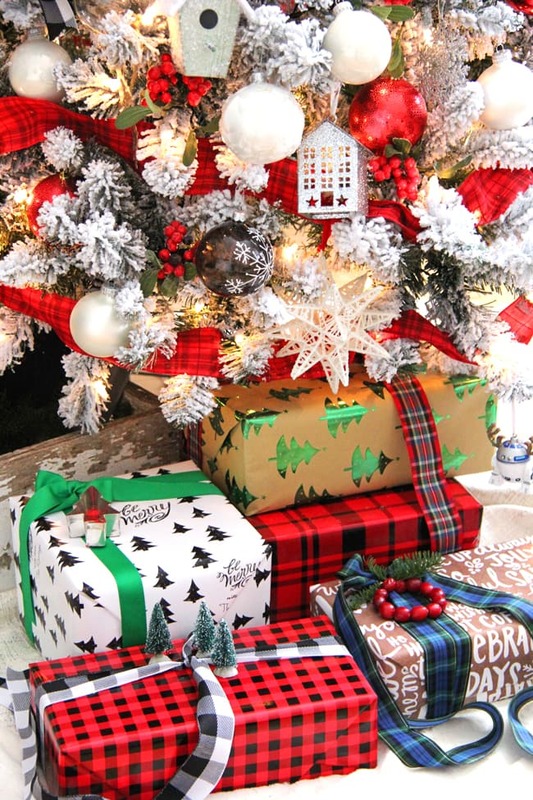 I love all the plaid, the cookie cutter idea, and especially the bottle brush trees. 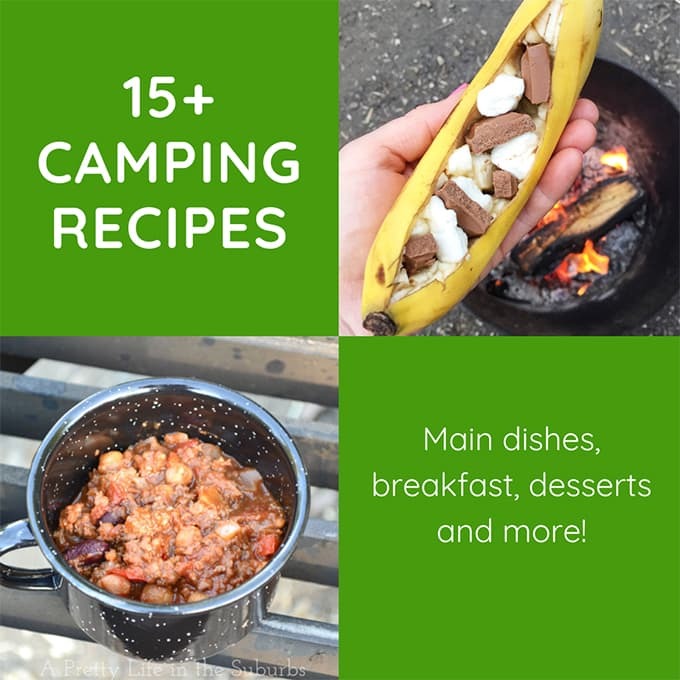 Thanks for the great ideas and beautiful photos! I love the photo greeting cards from Tiny Prints! I love the mailing labels. The Merry Woodland print is wonderful! I like the mounted wall art prints a lot. I love the one with the mini trees on top! Me too! Bottle brush trees are SO cute! I love looking a gift wrapping ideas! I’m really not that great a wrapper so I love all the great ideas I can find. Love the cookie cutter and the cranberry wreath ornament. They just add so much more to the wrapping. Very pretty! First , I love you eyeglasses! And I LOVE all of your wrappers! 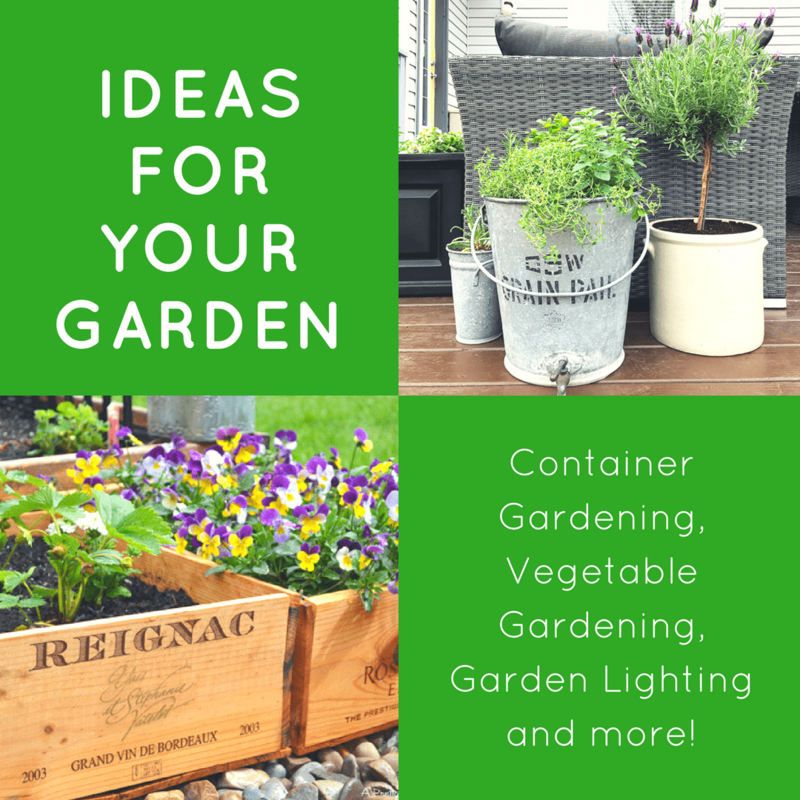 So creative too..I would love for you to share this over at Bloggers Spotlight Linky Party. 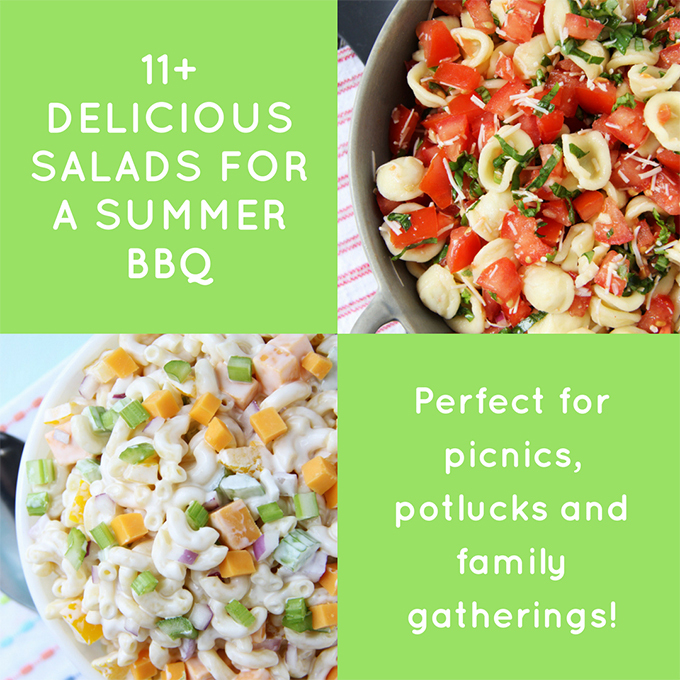 It is a link party and pin-it party in one! Hope to see you there! Gorgeous ideas, I especially love the plaid and the cookie cutter tag. Thank you so much Jennifer! I really appreciate the feature! Merry Christmas to you and your family!